Whenever you install asphalt shingles, you are counting on them lasting and being installed properly. We take pride in doing just that. Using the best products, tools and accessories, along with the best installation practices results in the best final product. What's Under Your Asphalt Shingles? Many contractors will skimp on underlay in an effort to be more price competitive when they install asphalt shingles. Some still use obsolete products like felt for underlays. Cheating on this step will reduce the life span of your new roof. The money you save in the purchase is quickly gone with a shorter than expected lifespan. Our commercial and residential sloped roofing installations use RhinoRoof™ and IKO Ice and Water Protector to provide superior protection against winter. These products will extend the effective lifespan of your roofing investment. 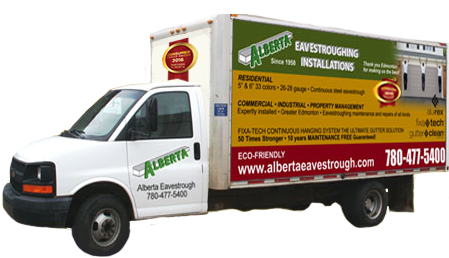 We will coordinate the installation services for new continuous eavestroughs to make your roof replacement complete. Heavy duty eavestroughs are available in widths of 5, 6, 7 and 8 inches and a large variety of eavestrough colours to complement your new roof. We have the largest selection of colours in Edmonton and are the only supplier of 8" gutters in northern Alberta.